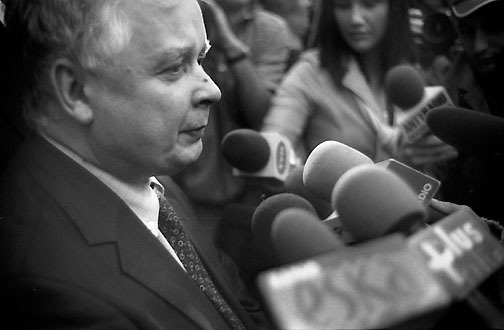 RIP Lech Kaczynski, and all the others on the plane with him. I happened to photograph him in Warsaw the year he became president. Of course a plane crash is always tragic for loved ones lost. Add to that a president dying, along with so many from the top levels of Polish government; that it was near Katyn forest, infamous for the 1940 massacre of thousands of Poles; that they were going there to commemorate the massacre, with relatives of the victims onboard; that it was an older Soviet-built plane. Just unbelievably cruel and profound symbolism. A cursed place, reasserting itself. Last night, I suppose around the same time, I had a brief nightmare that I was near the top of a skyscraper when an earthquake struck. The building began to sway, then it toppled over sideways. I had a physical sensation of falling from a great height. I wonder if earthshaking events (sorry for the pun) can have a ripple effect and penetrate our unconscious.